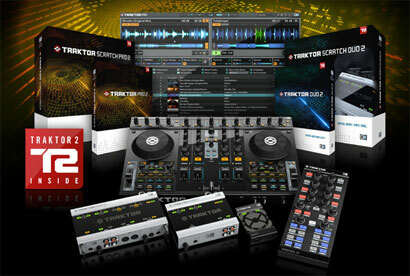 Native Instruments have launched the second generation of their popular TRAKTOR DJ software. The new TRAKTOR 2 range is designed to establish the next level of versatility and ease-of-use for digital DJs. A number of versions of TRAKTOR 2 are now available in stores worldwide: TRAKTOR PRO 2 software, the TRAKTOR SCRATCH PRO 2 digital vinyl system as well as two-deck DUO versions. With a wide range of new software features, including "TruWave" waveform displays, "SoftSync" track synchronisation, powerful sample decks and more, TRAKTOR 2 gives DJs even more creative possibilities. NI have also updated their hardware offerings with the new TRAKTOR AUDIO 6 and TRAKTOR AUDIO 10. These second generation of Native Instruments' acclaimed DJ interface units offer expanded connectivity and additional features - both as the hardware centerpieces of the new TRAKTOR SCRATCH versions and as highly versatile audio interfaces for any DJ or music production software. For the TRAKTOR KONTROL S4 system, the new TRAKTOR PRO 2 software replaces the originally included TRAKTOR PRO S4 version. All KONTROL S4 owners will receive a download upgrade free of charge.